While some choose to sail the seas and oceans seeking trade, adventure, and fame, others are more daring and sail the skies of their world's. Discover the wonders of flight and the beauty of sailing the winds from many different methods and in many different forms. After all, no one race dominates the skies...save those that need no ships and jealously guard their skies. Like sea captains traversing dangerous waters and unknown menaces, airship captains must face the wrath of the aerial realms in the forms of dragons and other invisible dangers that possible great risk to their airships. 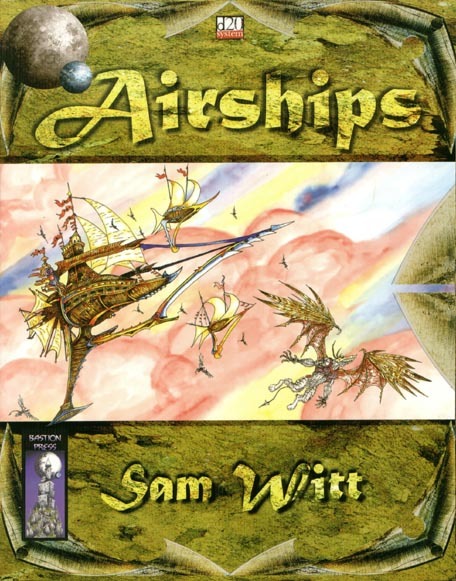 Airships provides all the rules necessary to bring flying ships into any campaign setting. Construction rules, combat, aerial and 3D movement, and other essential information is all covered. Also included are deck plans and specifications for a number of ships. Airships brings new heroes to the forest when a village under siege cries " Look! Up to the sky!"" Join me in the perusing of this d20 splatbook written by Samm Witt and published by Bastion Press. Alright, let's sift through the beginning fluff so we can get to the fun stuff. Tonnage. This appears to be the general factor that determines many of your airship's statistics. It determines your rigging, amount of crewmen, size of engine, and maneuvering. Each airship to is equal to 1,000 cubic ft. (a 10'x10'x10' cube), of enclosed space. A ship could be as small as one ton, and apparently there aren't any airships larger than 100 tons being constructed (currently). It is important to note that tonnage on an airship is not a measure of weight, but of volume. If, for some reason you need to know how much your airship weighs, calculate an average of 28,000 lbs. per airship ton. Like most generalities, we have to delve a bit into the abstract, it seems, when it comes to configuring your deck plans. Deck plans are a must if you are trying to accurately depict a map of your Airship so as to avoid confusion when it comes time for combat. They are definitely important when it comes down to deciding what elements and components your ship has - we will get to this juicy bit later. Tonnage of your airship determines it's size category. The Maneuverability number determines how many 45 degree turns it may make in a single round. So how does 0 maneuverability work? I'm not sure quite yet, but we will get there. I do know that there are a number of devices that you can get to improve your Maneuverability rating. Ships up to small size can be constructed without a construction yard. Each yard is rated by the maximum size of airship they can build, as well as the number it can build at one time. A yard rated Large (4) can construct up to 4 large vessels at a time. This doesn't mean that you can cram 2 medium ships into the same space for a larger ship. The production number represents "frames" in which a single airship can be built. Each ship, regardless of size needs it's own support frame. Construction Yards charge a flat rate of 200gp per month, per size category. There are several construction yard extras that offer more options. Calibrated Instruments - When mounting weapons on an airship these instruments provide a +10 insight bonusto the necessary skill checks. Cost: 800 gp per month. Cranes - Makes work easier on the backs of the laborers, providing a +10 morale bonus on Hull and rigging construction. Cost: 400 gp per month. Expert Laborers - All laborers are considered Expert skill level for calculating cost of labor. (discussed in next section). Cost: 800 gp per month. Gem Cutters - Expert gemcutters are available for the construction of gemstone or diamond Airships. Cost: 300 gp per month. Kiln - The yard has several kilns available in order to build ceramic hulls, providing a +10 circumstance bonus to skills involving ceramic hulls. Cost: 300 gp per month. Ship Smiths - These shipyards specialize in metal airships, and are all expert level. Cost: 300 gp per month. For a free PDF dowoad from Bastion Press that contains a preview, as well as additional information on Airships, go here. Also, a 30 ton (real tons, that is) airship is Fine? I guess they're using a different scale, but it *also* has AC 18. I am not sure where the author got his ideas/measurements from. Alot of the time I notice that the terms are very abstract and hold their own meaning just for gaming purposes, rather than exactly science. Yeah, everything is a different scale, but he uses familiar system terminology as the format.